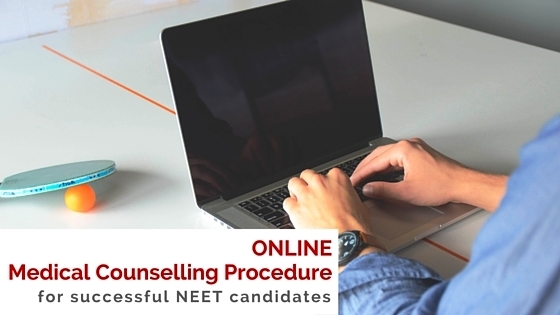 The counselling for Tamil Nadu medical admission 2017 got under way on 24 Aug 2017 for special categories. It changed gears on 25 Aug 2017 by calling 1209 candidates for day 2 counselling. 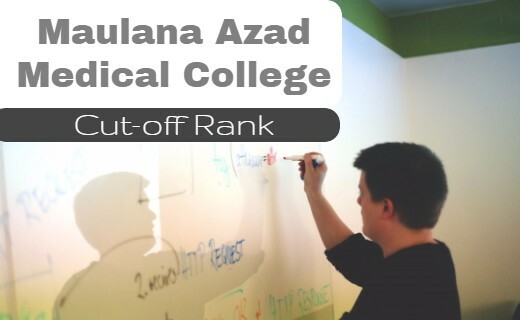 As usual, Madras Medical College, Chennai was the top attraction for medical aspirants followed by Stanley Medical College, Chennai. This article presents some findings from Day 2 counselling. Day 2 counselling saw as many as 1028 seats taken up (987 seats in state government colleges and 41 seats in self-financing colleges). The above table gives you the breakdown college wise for each category. All the Open Category seats in government medical colleges has been taken up. 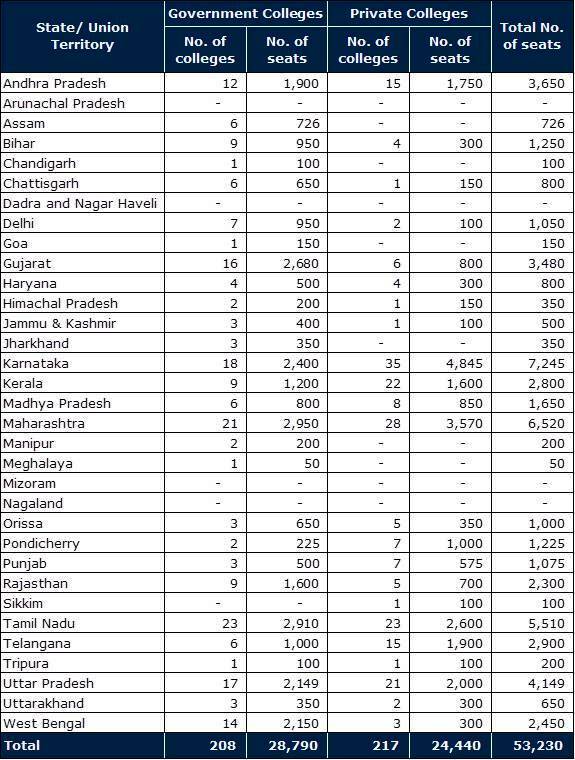 The cut-off rank for OC category in government colleges is State Rank 984. He took seat in ESIC, Coimbatore and his NEET marks is 385. 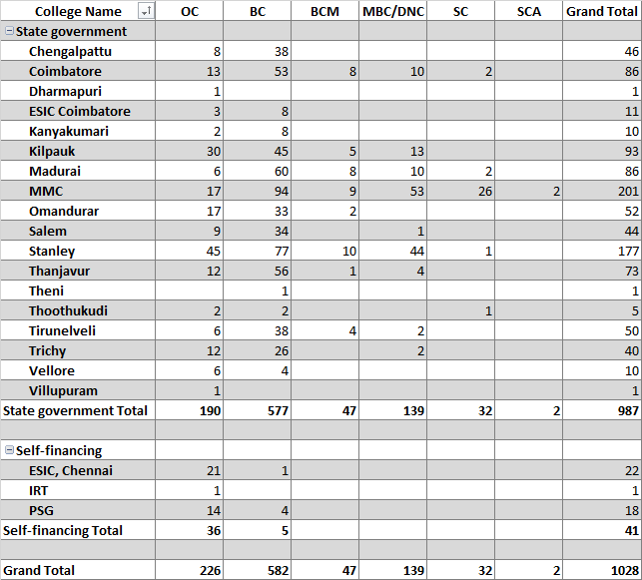 All OC, BC, BCM and MBC seats were taken up in Madras Medical College and Stanley Medical College. The following table shows the last rank who took admission on Day 2. The following table shows the vacancies available at the end of day 2 counselling. Though the door for OC candidates is closed for government colleges, they still can get some seats under merit quota in self-financing colleges. Below is the revised estimated cut-off based on the status at end of day 2 counselling. This is for your quick reference. 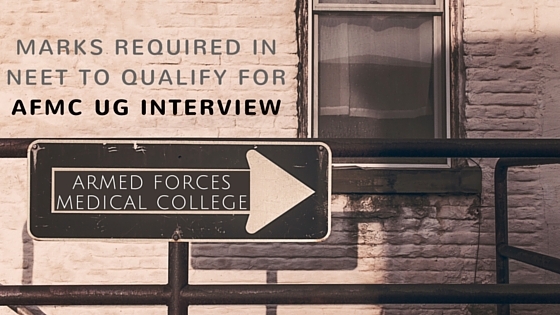 This may change based on the preferences of candidates in further counselling. 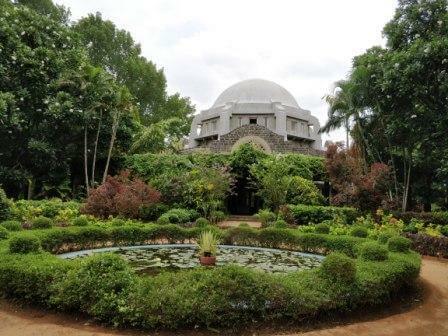 Wishing all the best for candidates attending counselling on day 3. HOW IS THE ADMISSION TO CMC VELLORE DONE THIS TIME AS NO UPDATES ARE RECEIVED FROM THEIR WEBSITE? You have not mentioned your community. 1. If you are OC, you would have got Kilpauk (MMC & Stanley - NO). 2. 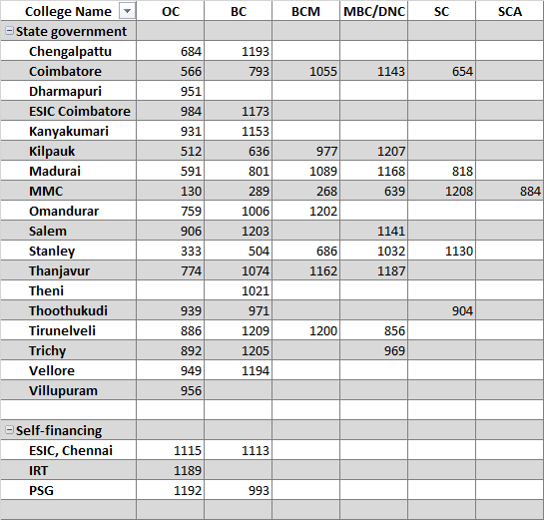 If you are BC/BCM, you would have got Stanley & Kilpauk (MMC - NO). 3. If you are from any other community, then you would have got MMC, Stanley & Kilpauk.